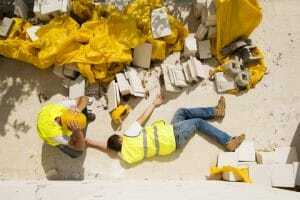 Have you been injured while working on a construction site? Call us today at 580-798-0447 to speak to an Oklahoma attorney specializing in construction accident cases. When someone is injured or killed on a construction site, it’s usually due to negligence, most likely the part of the employer. If you’ve sustained injuries on an Oklahoma construction site, we can fight on your behalf to get you the financial compensation you’re entitled to. Construction workers assume their work environments are just as safe as any other type of workplace. However, that is not always the case. Many people working in construction are faced daily with unsafe working conditions. Construction sites are often plagued with faulty equipment, unstable scaffolding, falling debris and falls. It is said that thousands of deaths among construction workers every year in the U.S. are just from accidents occurring as a result of faulty scaffolding. A construction worker on a job site with cranes risks being injured by the crane itself tipping over, rigging failures and/or falling booms. Welding accidents are fairly common on construction sites, as well as electrocution accidents. There are construction sites where the supervisors routinely ignore safety standards and do not take care of hazardous situations in a timely fashion, which jeopardizes the safety of everyone working on the site. If your injury is the result of this kind of negligence, you may be entitled to file a lawsuit against your employer to receive financial compensation for your losses, including medical bills, lost earnings, pain and suffering. Most companies in the U.S. have their employees covered under Workers’ Compensation Insurance. This insurance is run by the state and is designed to compensate employees who have been injured in an accident on the job. Although this sounds like something that would protect you, the reality is that most companies get this coverage in order to keep you from filing a lawsuit in the event you become injured on the job. If you work for a company with Workers’ Compensation Insurance, you need to know that employees are unable to file lawsuits against the company if they are injured or even killed in an accident at work. The exception to this would be in a situation where gross negligence occurred on the part of the company. But, what many employers do is try to fool their employees into thinking they actually have Workers’ Comp, when they don’t. This is all in an effort to keep from being sued. The only way you can find out for sure is by contacting the Oklahoma Department of Insurance. We would be happy to investigate this for you, without charge if you want to give us a call. Not Covered by Workers’ Compensation? If you’ve been injured on the job and your employer has no Workers’ Compensation Insurance, it’s unlikely that you would be automatically compensated for your injuries. However, you are allowed under Oklahoma law to file a work accident lawsuit seeking 100% compensation for whatever losses you’ve suffered due to your work-related injury. If you have any hope of succeeding with your claim, you must be able to prove that negligence on the part of your employer was the cause of your injury. To do this you are going to need help from a lawyer with many years of experience winning lawsuits for construction workers injured in on-the-job accidents in Oklahoma. Little, Oliver & Gallagher Law Firm specializes in construction accidents causing injury and wrongful death. We are available to schedule a free initial consultation to discuss your accident, explain your legal rights and offer our expert advice on how best to proceed with your case. You are going to need good legal representation if you are to prevail in court and get the financial compensation you deserve. Please give us a call at 580-798-0447 in Ardmore or in the Oklahoma City call 405-253-4478 to schedule your consultation. We are here to help you get the justice you’re legally entitled to so you can put this experience behind you and go on with your life.